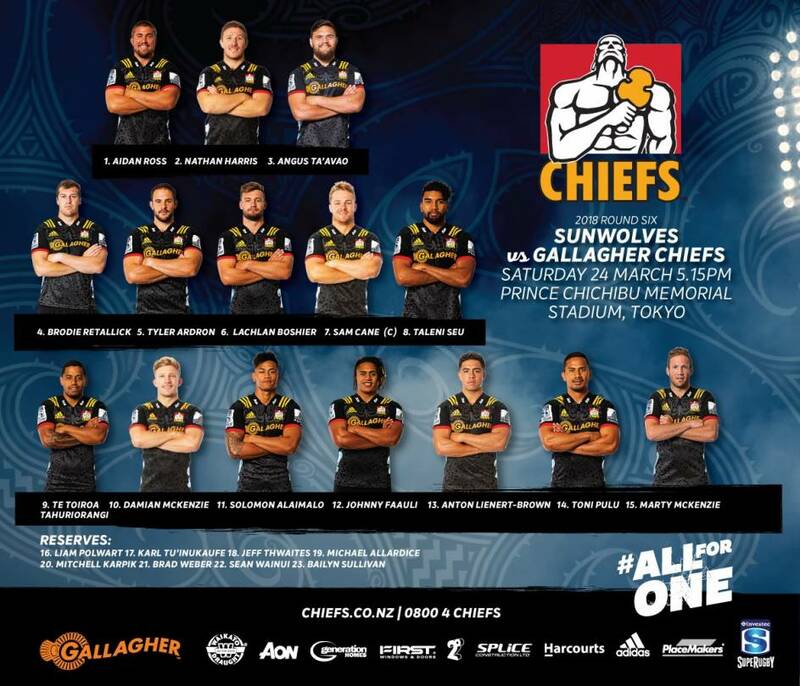 The Gallagher Chiefs have touched down in Tokyo for the very first time to take on the Sunwolves this Saturday in their Round Six clash at Prince Chichibu Memorial Stadium. The away side come in to this game buoyed by two confidence-building wins in recent weeks against the Blues and the Bulls. The Sunwolves were also very impressive in Johannesburg last weekend, narrowly losing to last year’s Investec Super Rugby finalists the Lions by just 2 points. Gallagher Chiefs Head Coach Colin Cooper was looking forward to the game ahead in Japan against the Sunwolves. “We’re really excited to be here in Tokyo, Japan. It’s the first time the Gallagher Chiefs have been here to play in this Super Rugby competition so it’s an historic occasion. We know how tough the Sunwolves will be to beat at their home ground so we’re focused on preparing really well for a tough match on Saturday afternoon. “We’re always seeking to create healthy competition amongst our group of men and there are a few players who have really put their hand up by training the house down these past few weeks. It’s great to be able to reward that effort with an opportunity. Marty McKenzie has earned a start at fullback and Mitchell Karpik comes onto the bench as loose forward cover. We’ve been hugely impressed with Mitch Karpik’s work ethic and he had an outstanding game for the University of Waikato Chiefs Taua Development team last weekend, his performance has demanded a place in the 23 this week. Cooper has made five changes to the starting fifteen who battled to the impressive 41-28 win over the Bulls at home last Friday. Canadian recruit Tyler Ardron comes in to the locking department to partner Brodie Retallick. It’s the Canadian’s first start for the team, after an impressive cameo off the bench against the Blues in Round Three. Taleni Seu also comes in to the loose forwards after a rest last weekend. In the backline, quick-footed Te Toiroa Tahuriorangi starts at halfback, after making a fantastic impact as a substitute against the Bulls last week. Speedster Toni Pulu is back from injury for the first time this season at right wing and Marty McKenzie starts at fullback with brother Damian moving to First-Five Eighth. It is a special evening for Waikato youngster Bailyn Sullivan who is in line to make his Investec Super Rugby debut off the bench in the number 23 jersey. Bailyn has been training with the squad throughout the pre-season and is also a member of the University of Waikato Chiefs Taua Development squad. The game kicks off at 5:15pm NZT and viewers can watch on Sky Sport One. Following this exciting Tokyo game, the Gallagher Chiefs have a massive fortnight of home New Zealand derbies coming up against the Highlanders next Friday 30 March and the following Saturday against the Blues, both to be played at FMG Stadium Waikato. Unavailable for selection: Dominic Bird, Tim Nanai-Williams, Charlie Ngatai, Fin Hoeata, Alex Nankivell, Regan Verney, Mitchell Graham, Sosefo Kautai, Sam McNicol, Atu Moli, Kane Hames, Shaun Stevenson , Mitchell Brown.